If you are a landlord, perhaps renting out your property for the first time, I’m sure this guide to renting your home will help you get the best from that experience. Since 2008, the UK property market has gone through an incredible amount of twists and turns. This year however, the British property market is looking like it is making a recovery that many of us should take advantage of while we can. Figures released from the latest Sequence index has shown that new tenancies across the UK have increased by 15% over the last 12 months, with monthly rental prices rising by 8%. If you are considering renting your property, it is recommended that you seek the help and advice from a property management company who can take all the hassle from you, managing both the property and the tenants that will be living in your home. Before this step however, we recommend that you consider our top tips to help you get the most out of your home when putting it out there on the rental market. It’s time to get the feather dusters and carpet cleaners out, as the last thing you want or need is to show potential tenants around when there is dust everywhere and dirt on the floor. First impressions count and a clean house and tidy garden and front entrance will make a whole load of difference to their first experience at your home. If you have been living in the home beforehand and have all of your personal belongings on show, it is recommended that you try to declutter much as possible and create the blank canvas all tenants will relate to. If you have time and can afford the expense, it is recommended that you paint the walls in a neutral colour so tenants can easily accessories and add their own personality. Make sure that you have all the electrics and gas checked on a regular basis and that you have certificates that prove this. Health and Safety should be important to you at all times as you are still the named owner of the property and so need to make sure that the people living in it are well looked after. A property management company will usually look after this for you. Everyone hopes and wishes for a good tenant but sometimes landlords do encounter problems. It is, therefored important to protect yourself from potential problems. Specialist landlord insurance will need to be taken out so that you are protected against any loss. Again, a property management company will be able to help you find the best option to suit you. A bit of paint here and some fixing of loose screws there will really help a house seem well looked after. Go round each room in your house and make sure hinges aren’t falling off, or paint is not cracking off the walls. If you focus on the small details, it will show a potential tenant that you are a reliable, conscientious landlord and care about keeping your home in a good condition. 6. Create a wonderful aroma! May sound silly, but a great way to make your guests instantly feel relaxed and welcomed into a home is to make it smell beautiful. Get the coffee brewing or bake some bread or cakes. If you aren’t currently living at the home and just showing people round, air fresheners and plug-ins are always a helpful accessory to create a pleasant aroma. 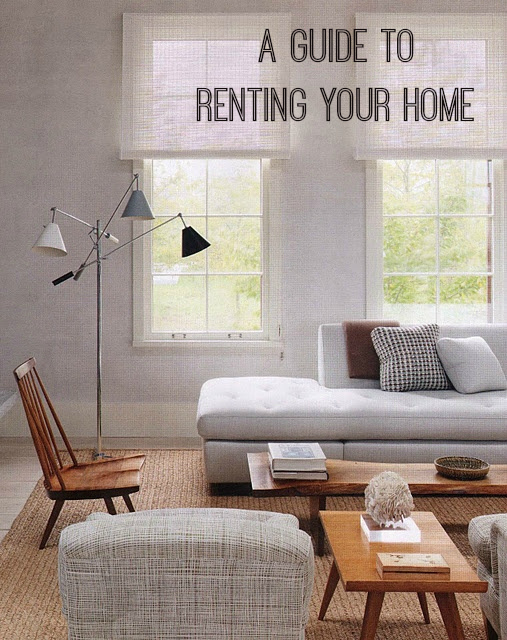 If you are renting your house furnished, make sure that you choose neutral colours that are practical and versatile. If your property is small then make sure that you consider the storage options available to the tenant by adding shelves or built-in furniture. This is an important factor to people when renting or buying a property so you should keep it in mind too! If you are looking into renting your house but want to take away some of the hassle, a good property management company is just what you need. You need to make sure that they look after both you and the tenant, so ensure that you take a look at their case studies and other properties that they have listed for their clients to see how well they are doing and how they best advertise their properties. Ask to see their procedure when dealing with problems and how much support they will give to you. It’s important that you choose the right company as they will be looking after possibly, one of your biggest assets! Good luck and happy renting! This article was written by Tem-po; a UK online estate agency who specialise in providing a marketing solution to allow people to advertise and sell their homes online with complete control.